National Lampoon's Christmas Vacation 2: Cousin Eddie's Island Adventure is a 2003 American made-for-television comedy film. It premiered December 20, 2003 on NBC and stars Randy Quaid and Miriam Flynn reprising their roles as Cousin Eddie and Catherine, along with Dana Barron reprising her role as Audrey Griswold. 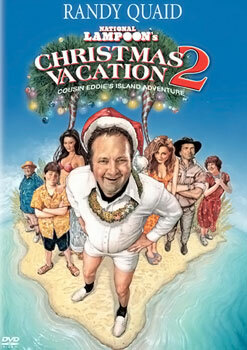 It is a spin-off sequel to the 1989 film, National Lampoon's Christmas Vacation. The story begins with Cousin Eddie at his latest workplace, a nuclear facility where he 'works' alongside a monkey. When the monkey outperforms him in every test (specifically mental agility), the decision is made to fire him. Upon finding out the news, the two get into an argument which results in the monkey biting him. With Christmas approaching, Eddie is worried about what this job loss will mean for him and his family and he decides to talk to his former boss. Although the thought never occurs to him, the nuclear company is convinced that he will sue. As a preemptive countermeasure, they offer him and his family (along with Audrey Griswold and his Uncle Nick) a free vacation to an island in the South Pacific. While on holiday they take a trip on a boat, while Eddie attempts to catch a shark, they get lost and eventually shipwrecked on an isolated island. Eventually Eddie is able to prove himself a man by providing for his family and they all celebrate Christmas together on the island. Shortly after, they are rescued - although when the pilot becomes incapacitated, it is left to Eddie to land the rescue plane safely. Once landed, Eddie discovers he has been given his job back. Dana Barron as Audrey Griswold, who tags along after dumping her married boyfriend Daniel. Barron is the first of the Griswold children to reprise their former roles, having originated the role of Audrey 20 years earlier in 1983's National Lampoon's Vacation. Edward Asner as Uncle Nick, Eddie's uncle who tags along after his wife leaves him. Fred Willard as Professor Doornitz, Eddie's boss. Sung Hi Lee as Muka Luka Miki, the family's guide around the island. Jake Thomas as Clark "Third" Johnson, Eddie and Catherine's pubescent son. Julian Stone as Melbourne Jack, the seapilot. Eric Idle as English Victim, a passenger on the plane. Idle also played the Bike Rider in European Vacation. Mike Stoklasa of RedLetterMedia's show "Best of the Worst" said the film "may have been the worst [he] had ever seen in [his] whole life." The cast ended the Christmas episode of the show by running a DVD copy of the film through a paper shredder, putting the shredded pieces in a Ziploc bag, and mailing them to Warner Bros. Pictures with a letter asking why the film was made. The film has an audience score of 12% on Rotten Tomatoes.